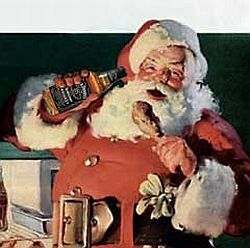 Santa typically unwinds with chicken wings & Jack. To me, Christmas has always been less confusing than other holidays for the at-home sommelier. Unlike Thanksgiving, where you sit down to ten courses and 10,000 calories, it’s a great day to spread the drinking around — Champagne with brunch, maybe a nice white wine or light red in the afternoon, and then a couple of big reds with dinner. Just be sure to drink well. Regular blogging will resume on Monday, December 29. Merry Christmas to you, David, and your Terroirist writers!